Here’s a little Gaussian process emulator example that I cooked up using the R package DiceKriging. Interestingly, even that problem goes away if you add enough data points. Error bars that get wider as you move away from the data are very sensible (but ideally they ought to include the uncertainty in estimating the parameters of the covariance function). That’s nice – Matlab? Python? I’ve got a time series version that my college Andrew coded up in RJAGS, which I think includes the hyper parameter uncertainty too. 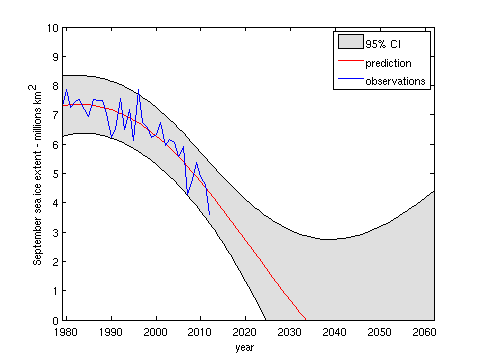 It isn’t a serious attempt to predict Arctic sea ice, I was mostly just experimenting with the toolbox, but it has done reasonably well over the last few years. but I haven’t used it very much (yet).